(Biaxially Oriented Polypropylene) BOPP Market size was valued at over USD 12.5 billion in 2015 and will witness gains at more than 5% CAGR by 2024. The global biaxially oriented polypropylene market size was primarily driven by significant product demand across labeling, printing, packaging and lamination applications. The overall insulation industry generated revenue close to USD 40 billion in 2015 and will exceed USD 75 billion with projected growth of more than 5% over the projected timeframe. This trend will subsequently boost the overall industry growth. The product owing to its superior clarity and strength is widely used in the food packaging, as it allows easy printing and coating over packaged food such as frozen food, snacks, ready to eat meals and confectionery. The overall food & beverage industry is experiencing escalating growth on account of improving consumer lifestyle dynamics and increasing spending power. For instance, the global food & beverage business was roughly around USD 8 trillion in 2005 and reached close to USD 15 trillion in 2015, which ultimately results in propelling the (biaxially oriented polypropylene) BOPP market size. Furthermore, increasing consumer awareness towards food preservation will substantially boost the product demand. BOPP is also used in in the cosmetic and pharmaceutical packaging. Strong growth indicators exist in the aforementioned industries, particularly due to rising consumer spending towards personal wellbeing. The overall cosmetic industry was valued at over USD 150 billion in 2005 and was marked close to USD 210 billion in 2015, this trend results in driving the global (biaxially oriented polypropylene) BOPP market size over the estimated period. The product based films are widely preferred in cosmetic and pharmaceutical packaging as offers superior barrier characteristics which helps in retaining the product properties such as aroma, at the time of prolonged storage. Polypropylene (PP) is the major raw material used in the overall industry. PP is crude oil derivate and therefore follows the similar price dynamics. Thus, wavering crude oil prices negatively impact on the global (biaxially oriented polypropylene) BOPP market price trends over the projected period. 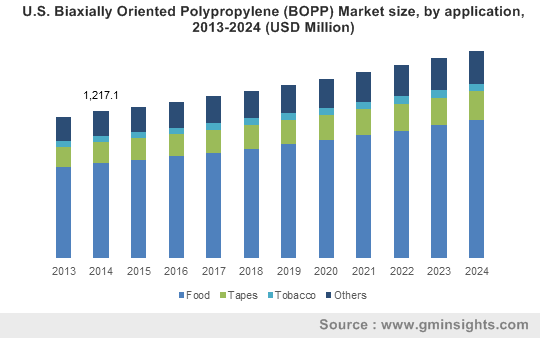 Growing product application as tapes across industrial packaging owing to its superior strength along with valued added feature such as clarity will create new growth avenues for the biaxially oriented polypropylene (BOPP) market share contributors. The global (biaxially oriented polypropylene) BOPP market share for food held the largest chunk, occupying more than half of the overall industry in 2015. The product finds widespread applications across food packaging die to its low cost, superior barrier and high durability characteristics. These properties help in effectively preserving the food freshness and aroma along with providing protection against moisture. Increasing working population across the globe, has substantially increased the package food demand, which has consequently driven the product demand. The global biaxially oriented polypropylene market size for tapes was valued at over USD 1.5 billion in 2015. BOPP packing tapes are being extensively used in the industrial applications including inventory and shipping owing to its superior optical and mechanical traits, which provides easy labeling and helps in differentiating the packed product. These tapes are thermoplastic polymer are therefore can be used across wide temperature range and are thus suitable for industrial applications. Tobacco is analyzed to witness moderate growth close to 4.5% over the estimated timeframe. The product based films are preferred in tobacco packaging as they offer high speed overwrapping and differential slip properties, this results in driving the global biaxially oriented polypropylene (BOPP) market size by 2024. North America biaxially oriented polypropylene (BOPP) market size was valued at more than USD 1.5 billion in 2015. Prevalence of robust pharmaceutical industry in the U.S is one of the prominent growth drivers in the region. In addition, the U.S. holds a prominent chunk of the overall package food sector on account of high consumer lifestyle dynamics. This is analyzed to positively impact on the product demand for food packaging. Europe, particularly led by Germany, the UK and France, was a significant (biaxially oriented polypropylene) BOPP market share contributor in 2015. The regional growth was chiefly driven by increasing product demand for cosmetic packaging. Asia Pacific led the global biaxially oriented polypropylene market size and will witness highest gains more than 6.5% CAGR over the estimated timeframe. The regional growth is majorly attributed to escalating food, pharmaceutical and cosmetic industry on account of enhancing consumer lifestyle dynamics and increasing spending power. Increasing number of working population in India and China and significantly increased product demand for food packaging. Furthermore, booming e-commerce industry in India has substantially propelled the industry growth for tapes. E-commerce industry essentially requires high quality tapes for packaging and labelling purposes, which will drive the regional (biaxially oriented polypropylene) BOPP market size by 2024. The global (biaxially oriented polypropylene) BOPP market share was highly fragmented with top product manufacturers accounting for less than 30% of the overall industry. Some of the industry share contributors include Biaxplen Ltd., Vitopel S.A., Oben Holding Group, SRF Limited, Xpro India Limited, Chemosvit A.S., Zubairi Plastic Bags Industry LLC, Rowad Global Packaging Co. Ltd., Kopafilm Elektrofolien GmbH, Polyplex Corporation Limited, Innovia Films, Dunmore, BIOFILM, Treofan Group, Uflex Ltd, Vibac Group S.p.a., Ltd., Futamura Chemical Co, Manucor S.p.A., Cosmos Films Ltd, Poligal S.A, Jindal Poly Films, Taghleef Industries and Tempo Group. These participants are engaged in upscaling their production capacity and diversifying their product portfolio in order to meet increasing product demand across the globe. For instance, Innovia Films has a diversified product portfolio and meets consumer demand for food and tobacco packaging. BOPP is a thermoplastic polymer which is extensively used in the food, pharmaceutical, tobacco and cosmetics packaging the product based films are manufactured by stretching across two axes sequentially. It offers valued added characteristics such as strength, clarity and high barrier, which makes it desirable across packaging applications. Robust growth signs in the food & beverage industry is one of the major biaxially oriented polypropylene (BOPP) market drivers. The industry share for food applications accounted for more than half of the overall share in 2015. Regionally, Asia Pacific, mainly led by India and China comprised of the major chunk in 2015 on account of rapidly growing population, improving consumer lifestyle dynamics and robust BOPP tapes demand for industrial applications such as packaging.